● Aric Almirola started fourth and finished Stage 1 in fourth to earn seven bonus points. ● Almirola and the Stewart-Haas Racing (SHR) contingent ran the entire stage in positions one through four. ● During the Stage 1 break, the Tampa native reported the No. 10 Smithfield Bacon for Life Ford was “handling pretty well.” He visited pit road for fuel and four tires during the break. ● Almirola started Stage 2 in eighth and ended it in fourth to accumulate another seven bonus points. ● Almirola started the second stage eighth and remained in the top-10 until the second caution of the race came out on lap 63. During the caution the Smithfield driver pitted for fuel only. ● The pit strategy worked out well for the No. 10 team and SHR with all four Fords restarting in the first four positions on lap 66. ● The Smithfield driver stayed out on track through one more caution to end the stage in fourth. ● The Stage 2 break allowed Almirola to visit pit road for fuel and four tires, but varying pit strategies meant the 34-year-old had to restart in the 19th spot, the furthest back he had been all day. ● Almirola started the final stage 19th and ended it as the race winner. ● After the green flag dropped on the final stage, Almirola began to work his way forward and, by lap 124, he was up to the third. ● When the sixth caution came out on lap 136, Almirola was seventh and visited pit road for two right-side tires and fuel. ● He restarted sixth on lap 142 and was back up to third on lap 159, when the caution was displayed once again. ● The No. 10 team, along with its SHR teammates, stayed out for the seventh caution of the race, and Almirola restarted third. ● One lap after the green flag was displayed, Almirola was fourth on lap 165 behind his three SHR teammates, and the four stayed together and held their position well in front of the field until the final caution period for a multicar incident behind them on lap 187, just one lap before the scheduled race distance. ● With the race extended past its scheduled distance, fuel became a concern for Almirola, who last pitted on lap 138, and his SHR teammates. It was calculated the No. 10 would have enough to complete one attempt at a green-white-checkered finish. ● The race restarted on lap 192 with Almirola in fourth place. Shortly after, teammate Kevin Harvick ran out of fuel and had to pit while Almirola moved into second behind teammate Kurt Busch. ● Busch then ran out of fuel on the final lap, and Almirola was able to move into the lead and hold it for the win. ● This was Almirola’s first victory of 2018. ● Almirola earned his first victory in 18 career Monster Energy NASCAR Cup Series starts at Talladega. ● Almirola’s one lap led on the final lap increased his laps-led total at Talladega to 16. 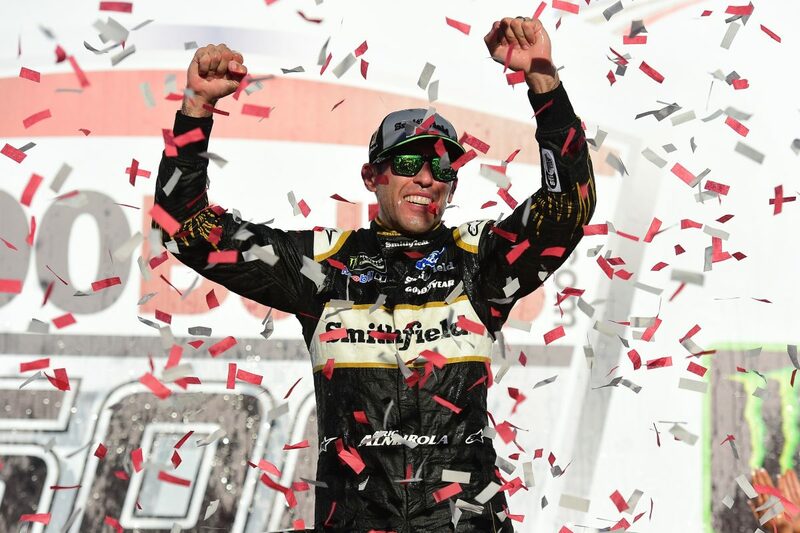 ● Almirola’s victory in the 1000Bulbs.com 500 marked the 56th overall win for SHR. It was the organization’s milestone 50th points-paying Monster Energy NASCAR Cup Series win and its first victory at Talladega. ● Almirola’s win marked SHR’s series-leading 11th points-paying victory 31 races into the 2018 season. SHR also won the 2018 Monster Energy NASCAR All-Star Race. ● This was SHR’s 14th Monster Energy NASCAR Cup Series victory with Ford. The team won its first race with Ford when Busch captured the 2017 Daytona 500. ● Almirola’s triumph delivered the 105th points-paying victory for Ford’s Fusion in the Monster Energy NASCAR Cup Series. It was Ford’s 674th all-time win in the NASCAR Cup Series. ● Ford now has 28 all-time series wins at Talladega, including 10 of the last 13. This was its seventh straight Monster Energy NASCAR Cup Series victory at Talladega. ● This was Almirola’s second career Monster Energy NASCAR Cup Series victory and his first since joining SHR this year. “I felt like I kept giving it away, and I was so disappointed for all these guys behind me because they’re awesome. They’re the best. I’m with the best team in the garage, and I felt like I kept letting them down not winning a race. Today, the good Lord was shining on us and we went to victory lane. We did it, finally. “I knew (we were going to have a good day) when we qualified, all four of us starting up there in the front. We kind of talked about it in our competition meeting, that we needed to be committed to each other, we needed to score as many stage points as we can, we needed to score more stage points than the 12, than the 42 and the 88. We knew all that. Going into the weekend, that was our focus, was to be committed as an organization to doing everything we can to help each other, making sure that we continue to get points, especially for Clint and myself being in the situation we were in going into this weekend. Then when we qualified top-four, all of us together, I knew that all four of us were going to be tough to beat. We were going to have really fast racecars. We’ve been chasing those Penske cars. We talked about it Saturday. We’ve been chasing Penske at the restrictor-plate races. They’ve been able to do somewhat of what we did today, where they get out front, Brad and Joey and Paul and Blaney get organized, basically dominate the race. Today, we were able to do that. We stayed so committed to each other. We worked every restart out to where we stayed committed to each other, got in line. It was us against the field. “When we started to drive off from the field in the first stage, as the stage went on, I knew we had something special. I knew one of our four cars was going to win. Just by happenstance, we were the ones that qualified fourth, so I kept being the third or fourth guy in line. It was like, ‘Man, this is nice that we’re all four running together, but I’m scoring less stage points than Bowyer – I’m racing him in points. Eventually we’re going to have to try and win this race, we’re going to have to separate and start to fend for ourselves.’ That opportunity honestly never really presented itself. It seemed like, the way the race played out, such long green‑flag runs, we would get committed to each other. As we would drive away from the field, me being the fourth guy in line, I never really had anybody behind me to help me make a move on my teammates.